Marbella provides an idyllic setting for practicing water sports in all its many beaches: windsurfing, diving, water skiing, fishing or just to browse. It is an ideal place for entertainment and leisure, with a sensational annual temperature and with a free environment, with clean air, clean place. But if a sport is world is golf. Once fields are distributed throughout the municipality. Some of them are in particularly beautiful surroundings, such as Santa Clara, as it is in a natural vantage point from which the Mediterranean Sea can be seen. In this wonderful place we find the Santa Clara, very close to the golf course of the same name. As we approach the city from Malaga airport, we find a group of houses, villas and plots sitas around a magnificent golf course. 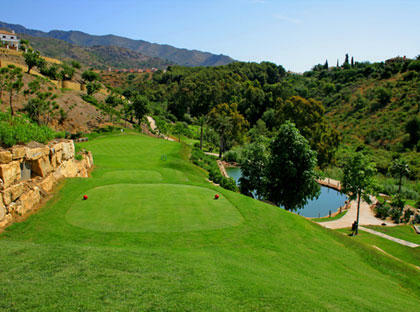 This is the Santa Maria Golf, perfectly located in the area, as separate 30 minutes from Malaga and 10 from Marbella. Golf course allows the player to enjoy wonderful sea and mountain, populated by oaks. On the ascent to the Sierra Blanca, following the path Camoján find the CAMOJAN WATERFALL complex, in an idyllic setting. Next to it we find the golf course that named another of the developments in the area: MONTE PARAISO. This field, quite young (2003), is equipped with the most modern and convenient facilities, one of the most demanded in the area. Other equally notable fields in the area are the Royal River, Greenlife Golf Club and Real Golf Club Las Brisas. 4.5 of 5 based on 1092 votes.